When your son is 32 and about to have surgery for his ACL and MCL repairs on his knee then a Mum does what a Mum does best, she hops into the car and heads to the other side of the city to look after him. Antony was scheduled for surgery on Friday afternoon and with it being Auckland Anniversary weekend I knew the roads would be busy so I headed off down to his place in Papakura on Thursday ready for an easy trip into the hospital in Epsom on Friday. Midday Friday and we arrived at the hospital in plenty of time however we both commented on our way in that the southbound traffic on the motorway was starting to build up which made us think that the better way for me to return to Papakura would be through Mt Eden and onto the southwest motorway. It’s just as well I know my way around Auckland reasonably well and can try and circumnavigate any traffic issues. First, we got Antony admitted into the hospital and ready for his surgery which would be happening in a couple of hours time. 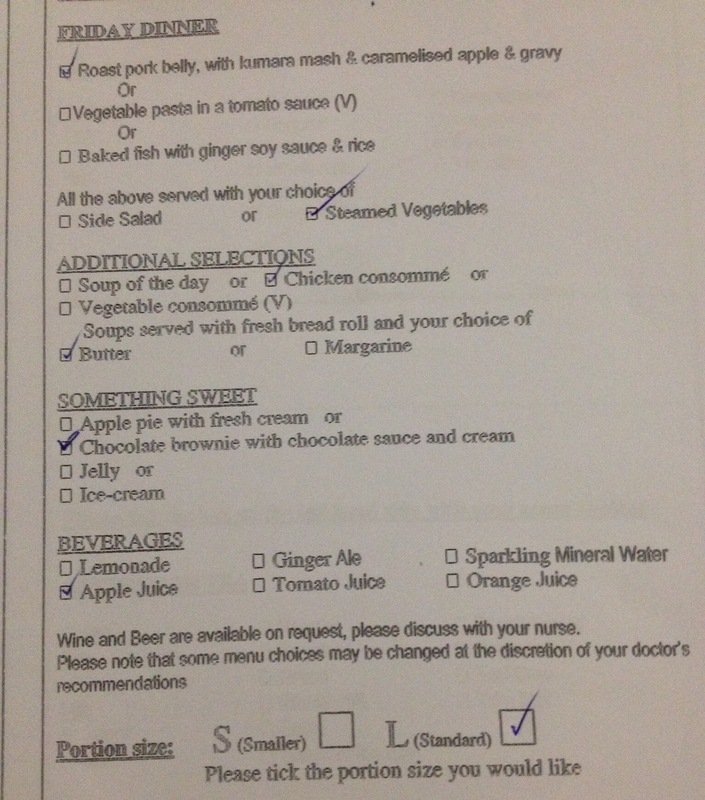 There was the usual medical things to attend to but also the menu to fill out for his evening meal and breakfast tomorrow. This was his evening menu choice…. Not bad eh? 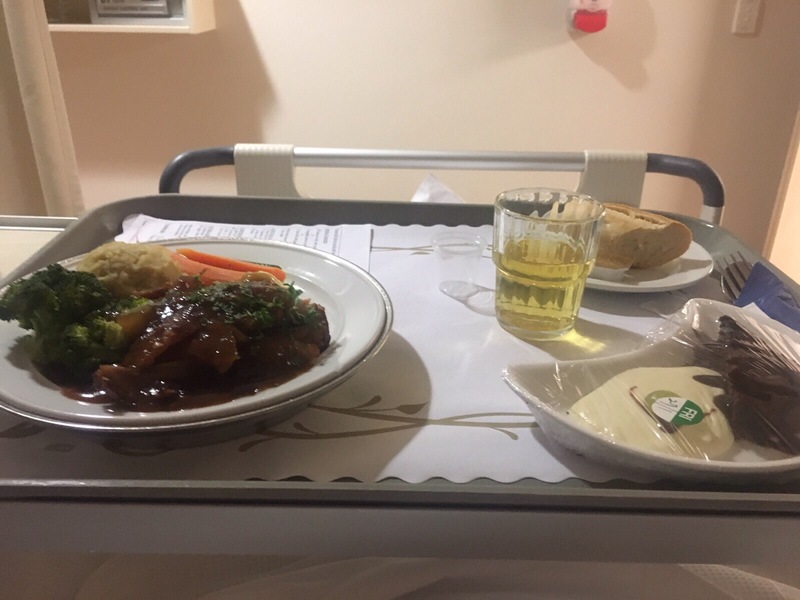 Mind you, I’m not so sure that dinner is high priority in ones mind after surgery, but as he had not eaten or drunk anything since the previous night then I guess he may be a tad peckish. I left him in the care of the medical staff as there was no point in me waiting around as I could not really do anything and the surgeon would call me once Ants was in recovery to let me know how he got on. I headed back throuh Mt Eden and onto the the south west motorway. It was a trouble free, traffic free, run all the way along the motorway until approaching Manukau where, luckily, the electronic motorway info board was telling me that the southern motorway was blocked from Manukau south and I could see the traffic queued ahead of me for the on ramp. So quick decision time, get off and head to Papakura over the back road. 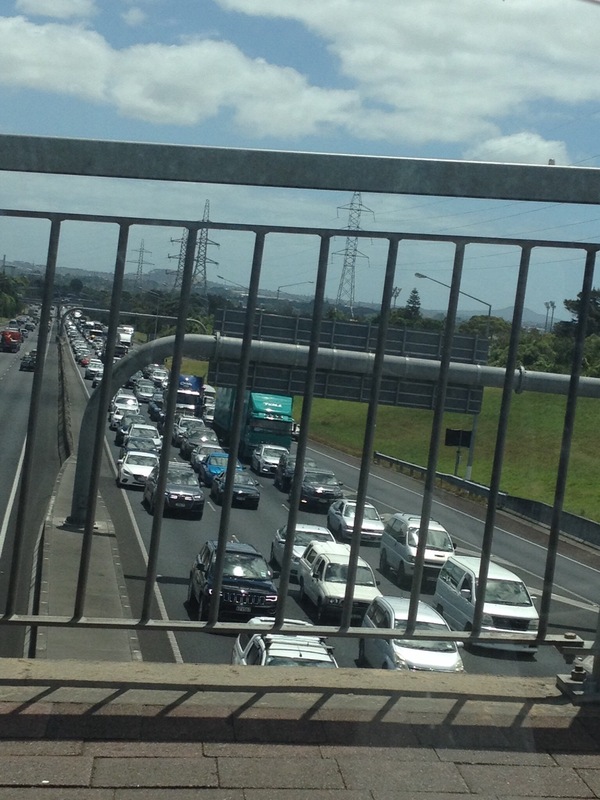 Just as well I took this option as the following was the sight from the Manukau overbridge looking north. Looking south was even worse but I didn’t have time to take a photo of that. I found out later that there was a car on fire further south and all lanes were blocked. Even so, my return trip took just over an hour whereas it is usually a 30minute journey. 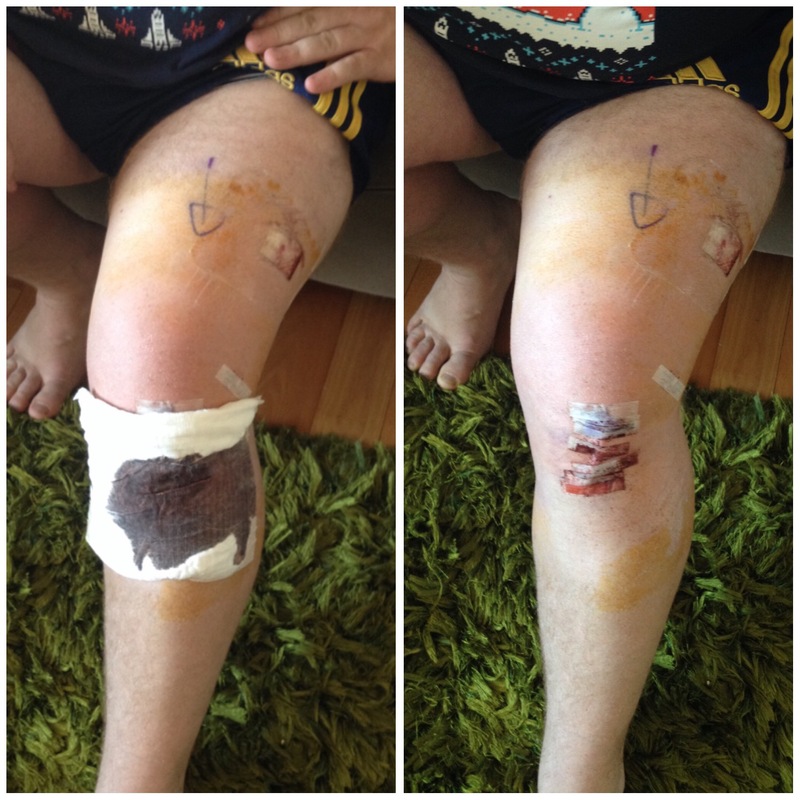 It didn’t seem as though I had been back very long before the surgeon rang to tell me all was well and everything had gone to plan with the surgery and I could pick him up the following morning. And it doesn’t look bad either. I returned the following morning, following the same route, and after been given all the instructions for wound dressing and with prescriptions to fill on the way home, we were soon on our way. 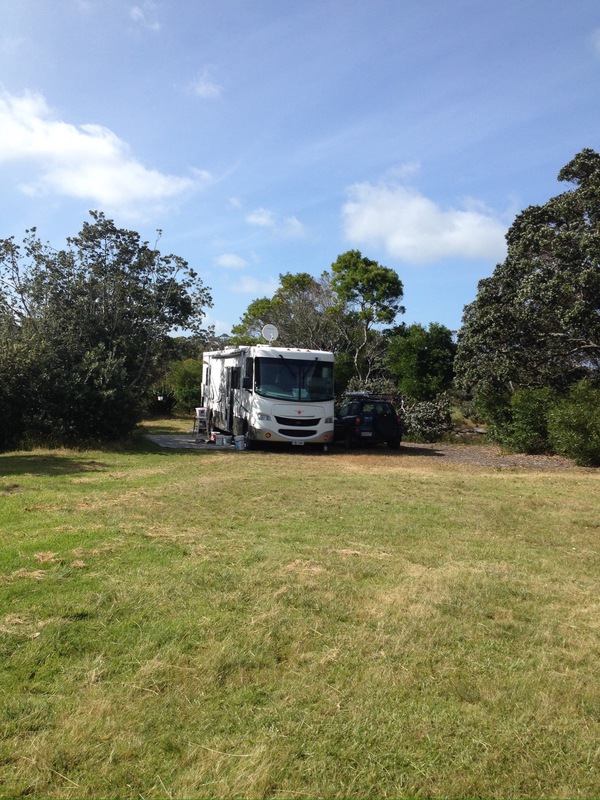 We left Matai Bay on a Sunday afternoon for Kaitaia as the van was booked in for the final bit of work to be done on the brakes as the parts had arrived from the USA, as well, a couple of other jobs were being completed. However, things never seem to go smoothly, the parts that we had had sent out were not the right ones. As you were folks, put everything back together then spend the next day researching and checking on hopefully getting the right parts. It would be so much easier if there were part numbers, or if the size matched what was supposed to be on the van. Anyway, in the end it was all sorted, more parts ordered and we were sent off to return at a later date. Off we went to Rarawa and the DoC camp there, where Pat & Sue were already parked, we set ourselves up, this time in another location, tucked into a corner on the upper level. The weather has been pretty good, although we have had a lot of wind with some of it even from the right direction for some kite fishing. But more on that later. A large part of the camp is roped off as they had recently closed the whole camp whilst they dealt with an infestation of Argentinian Ants. Who knew that these tiny creatures could create such damage. According to the DoC website Argentine Ants are one of the world’s most invasive and problematic ant species. They are very aggressive, and although they are not poisonous, they do bite. Unlike other ant species, Argentine ant colonies cooperate with each other, and can combine over winter into super-colonies. They reach enormous numbers, which means they have a huge appetite. It also makes them more aggressive towards other insect populations through their sheer numbers. The best way to tell Argentine ants from other ants is by their colour and trails. Argentine ants are small (2-3 mm long)and honey-brown in colour, while most other common household ants in New Zealand are black. The camp will be closed again from next week so that DoC can do a secondary bait laying process to make sure they are all dealt with. Meanwhile, I (Bernice) have been to Auckland and back for a few days. A trip which is around 5 1/2 hrs driving time each way, plus of course you have to allow more time for stops for refuelling both the car and driver as well as the odd traffic hold ups. 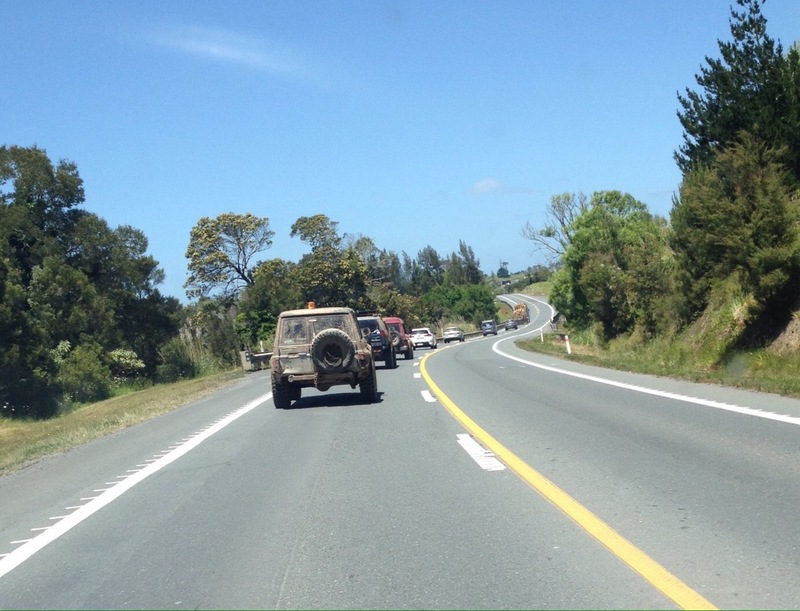 An interesting sight on the way down to Auckland was this convoy of three four wheel drive vehicles which were absolutely covered in mud. Actually, it was a bit of a serious oops as it seems he has torn his MCL and ACL ligaments in his left knee. Ouch. I went down to give him a hand with a few things and also to provide moral support when he went to see the surgeon and make sure we asked all the right questions. His leg is very swollen and bruised from above the knee right down to his foot, and of course rather painful. But what I didn’t realise was that before he can have surgery to repair the damage, he has to have regained the full range of motion in his knee. So today he starts physio. Meanwhile Mum did her thing, by washing, cleaning, tidying, cooking, shopping, transporting. 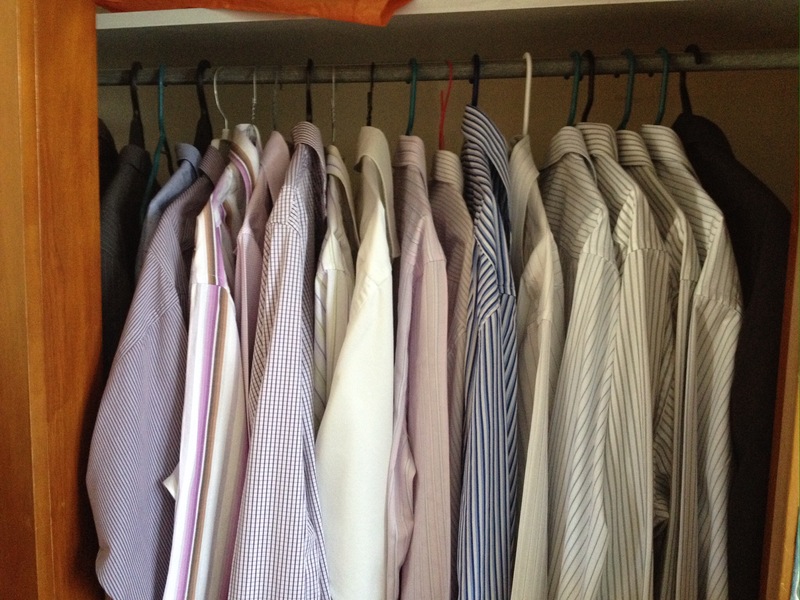 Oh and even a bit of ironing… some of the 17, yes that right, 17 shirts I ironed!! Once I had done as much as I could it was back up to Rarawa. 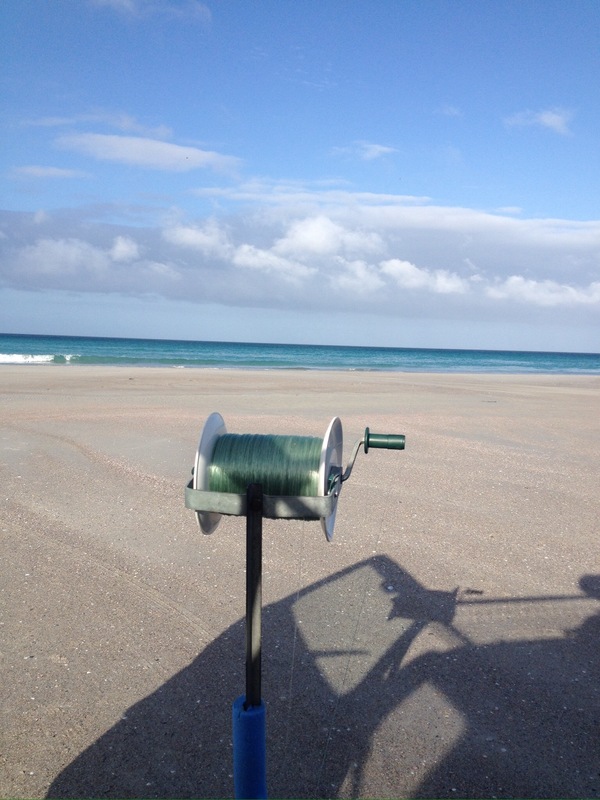 We have been fishing a few times off the beach with some success as well as a good failure when on one outing our line got caught on something and we lost all our traces, sinkers and hooks. Luckily this all happened before I went to Auckland so I was able to call into the store to replace all the lost gear. But with days like this in the picture below, what could be nicer than spending an afternoon on the beach? Somewhere out there is a kite, and of course some fish on our line too. Next week it is back to Kaitaia to have the last bit of work done on the van before we move southward ready to start our camp hosting duties at Shakespear for ﻿the summer.